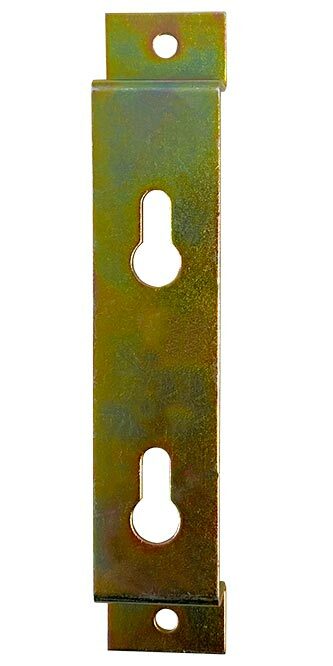 Place a wooden bird house onto a wall or 4 x 4 post easily using this Erva Bird House Mounting Bracket with Keyhole Openings. This slender, convenient adapter is perfectly suited for use with bluebird houses or other bird homes with a flat back, and its steel construction creates a durable piece. The center of the unit extends from the top and base, and two keyhole openings on this section may be placed against your post, fence, or tree with ease. The top and base of the bracket have predrilled holes to connect to your existing bird house, and the beige color of the item blends with your wooden house. Included small and large screws keep this adapter in place on both the home and post, and the hardy steel construction and powder coated finish will withstand exposure to the elements. Display your existing bird house on a fence, post, or tree with help from this Bird House Mounting Bracket with Keyhole Openings. Made in the USA.